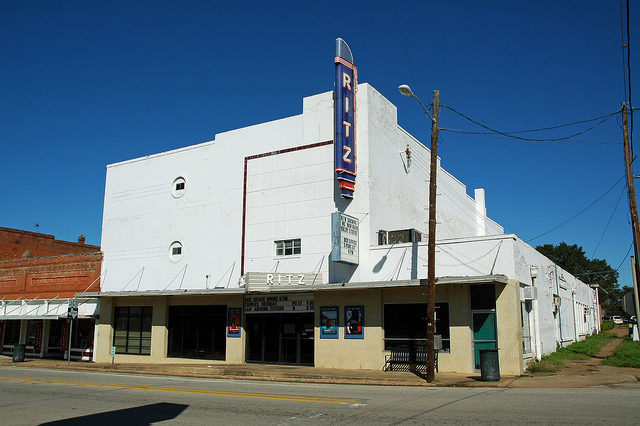 The Ritz closed in 1990, and for three years the neglected marquee of the one-screen theater in Crockett, TX was perpetually showing Gremlins 2 and Fire Birds (a rare Nic Cage action film that actually precedes The Rock). I think every one in town assumed the place was closed up for good, though there were always rumors that it was going to suddenly throw open its doors and start playing movies again. It took until May of 1993, with a double-bill of Aladdin and Groundhog Day, before it started its current run, under the management of Bill and Christine Schulman. CountryLifeOnline.com has a history of the Schulman Theatres, and it’s mostly stuff I’ve heard first-hand from Mr. Schulman himself. Right when I got out of high school, I went to work for the Schulmans for that grand re-opening, and continued to work for them right up until I moved to Austin, Texas in 1998. Mr. Schulman trusted me with a key to the place, and even after I quit, I held on to that key for posterity, not letting it go until my wedding in 2002 – a wedding that took place in the Schulman’s Ritz auditorium. That key allowed me to go in and make up and break down the films that would arrive, but also (with Mr. Schulman’s permission, of course) allow me and a guest or two to sit up in the formerly “coloreds’ only” balcony of the old place on weekends and watch trash cinema (biker flick The Devil Riders, faux-documentary Forbidden Sexuality and Texas-made stag cheapie Common-Law Wife) and Woody Woodpecker reels that he’d collected over his many years of theater operation. I can draw a direct line backward from my current job as a movie critic and blogger to the days when I was a teenager with my own access to a movie theater any time I wanted. I worked for the Schulmans at the Ritz, and for a short stint at the Palestine Twin (to help out with overwhelming crowds for The Lion King) which set the stage for my job as assistant manager at the Dogwood 6. I met my best friend and current “boss” at the Ritz. I met my ex-wife at the Dogwood 6. I made friendships that have lasted forever and life choices that continue to influence me, all because of the ripple effect caused by Bill Schulman. Bill Schulman liked me, and I liked him. He was quick with a laugh and a smile and a strong squeeze of the shoulder; he was short, but compact and muscular, even into old age. He had his own made-up slang for concession items, like “birdseed” for popcorn, “carbonated lemonade” for Mountain Dew, and “expectant’s delight” for pickles. The one that always got the laugh from customers was whether they wanted their M&Ms “male or female.” The difference? Males have nuts. I would gladly listen to his stories dozens of times over – about his victory in an exhibitor bidding war for Dune, or the box office employee who was shot in College Station, or the rescuing of old 35mm prints from being destroyed. I’m tempted to call the recording at the Ritz right now, just to see if his voice is still there, loudly announcing showtimes and mangling the names of fly-by-night fad celebrities. I know it’s not though, and any other voice would disappoint me. I loved Mr. Schulman, though I never told him as much. When I would come into town for any extended period of time, I would stop by and say hello. The last time I saw him was in 2008. 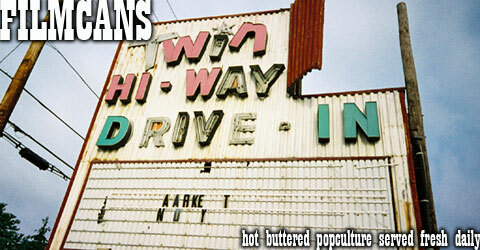 Looking for comfort in my old digs, I took in a double-feature of Leatherheads and The Ruins. Mr. Schulman was still going strong, running the entire operation by tooth and nail. He was happy to see me, and we hugged and chatted like we always did – as if no time had passed at all and I was still my eager 17-year old self. We all get old and pass on, and I knew this day would eventually come, but I was really kinda hoping he would outlive me so that I wouldn’t have to think about a world without him. Bill Schulman was important to me.